Quite some time ago, at Mode of Life weblog we received a particular request made by one of our readers, who wanted some information or articles on St Spyridon the wonder-working Bishop and Confessor of Tremithoundas. We regret we were not able to respond to the request sooner, and given that we are inundated with various articles and translations that are intended to be published in the near future, we regret that we were not able to research and write up something of our own on this great Church Father. Yet we would like to highlight, as we believe, that there are others who have written extensively and far more eloquently and precisely about Saint Spyridon. Consequently, we have chosen to respond to our reader request, and supply all our readers with a selection of some very good articles that relate the life and works of St Spyridon, as well as some of his miracles and appearances that have occurred since his falling asleep in the Lord. Therefore, we hope you enjoy our particular selection, some of which I believe can be found on other Orthodox websites and weblogs as I suspect, since these were amongst some sent to our email by another fellow associate involved in another area of ministry. Suffice to say, the article I found most enjoyable to read is the work of Mother Cassiana, but as those familiar with the original work will observe I have made some slight alterations and corrections to ensure accuracy with the original Greek hagiographical account and with precise theological terminology or English expression. In any case, to you the reader, this does not need concern you or reduce your enjoyment and spiritual edification from learning about the charismatic and humble figure of Saint Spyridon of Tremithoundas. Translated and adapted (with additional information provided) by Mother Cassiana. Saint Spyridon has remained one of the most beloved saints in the Orthodox Church throughout the centuries. Clergy and laity alike can identify with this holy bishop. He was compassionate, but firm and loving; a humble shepherd, bishop, confessor of the faith during times of persecution, and an outstanding teacher of Orthodoxy at the Council of Nicaea. He did not allow his episcopal rank to distance him from the faithful of his diocese, but was truly united with the people, loving them as a true father. He worked many miracles both during his life on earth and after his repose, even to the present day. This holy father was born on the island of Cyprus. No date for his birth is given in the hagiographical account of his life, however, considering that he was already a bishop at the time of the First Ecumenical Council in Nicaea in 325 A.D., it can rather safely be assumed that he was born in the latter half of the third century. His parents were simple people, and raised their son in a humble and pious home where love for God abounded. In his youth, Spyridon was a shepherd, watching over the flocks. Later, even as a bishop, he continued to keep sheep. He was not an ambitious youth, anxious for a position in society; instead he was content in the quiet country life of work and prayer. The hymns sung on his feast day liken him to a number of Old Testament figures, saying that he was gentle like the Prophet David who had also been a shepherd in his youth; like the patriarch Jacob, he too was humble of heart; like the great Abraham, he showed hospitality to all; he had the innocence of Job and the goodness of Moses. Spyridon married at the legal age; again, however, the lengthy account of his life in the ancient Church writings, are silent as to the name of his wife. They had several children, one of whom, a daughter named Irene, would later figure in a miracle worked by this saint. As a husband and father, Spyridon continued to live an honest life pleasing to God. 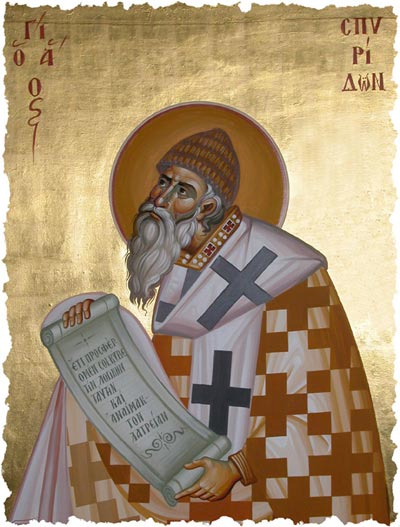 Some accounts state that Spyridon’s wife died while rather young, others make no mention of her at all, and still others name Saint Spyridon as one of those early bishops of the Church who was, indeed, still married during the time of his episcopacy. 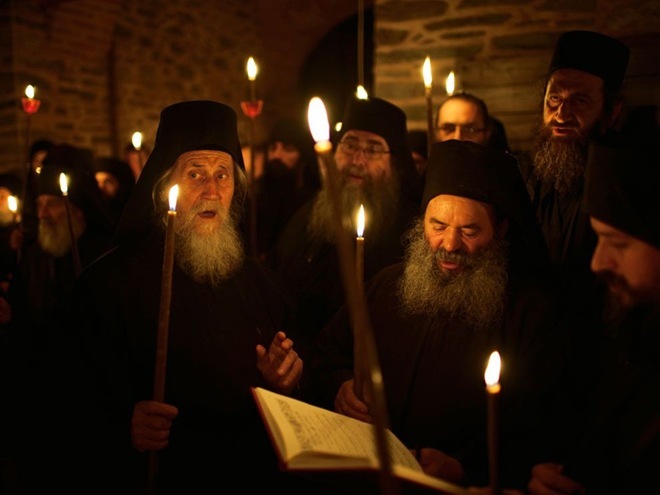 The canon in the Orthodox Church of bishops being chosen exclusively from the monastic or celibate clergy has been in effect for many centuries, however the earliest years of Christianity did see a number of married men elected to the episcopacy. This rule of candidates for the episcopacy being chosen from among the celibate, monastic or widowed clergy was not strictly enforced or considered the norm until after the time of Spyridon’s life. In fact, earliest mention enforcing celibate bishops is not found until some two hundred years later! 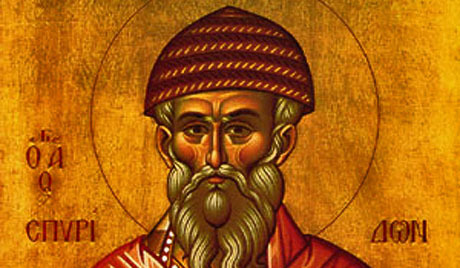 In his History of the Church, the early historian Eusebius, a contemporary of St. Spyridon’s mentions at least two bishops specifically as being married during their episcopacy: Chaeremon, from the mid third century, “the very aged bishop of Nilopolis, fled with his wife to the mountain region of Arabia” during the persecution of Decius; and Demetrian, bishop of Antioch from 251-253. It must be remembered that the Church only began to feel the effects of monasticism in the fourth century. It was this influence, along with other practical considerations, which led the Church, under the guidance of the Holy Spirit, to develop the requirement that bishops be chosen from among the monastic, or at the very least, celibate, ranks. Why, then, do various sources seem to be at variance with each other regarding Saint Spyridon’s marital status? This could possibly be understood if we take into consideration the audiences for which these accounts were written. For the past several centuries, the faithful, both educated and unlearned, have known that bishops must be celibate. Church writers were aware that their readers (or listeners, since many of these accounts were written to be read aloud in church) were simple folk, pious, but uneducated in the development of the rules and canons to which the Church adheres today. Such people would have been scandalized to hear that a bishop would be married! To avoid such an attitude, many hagiographers chose to either gloss over certain facts, or to rearrange them to suit the populace. 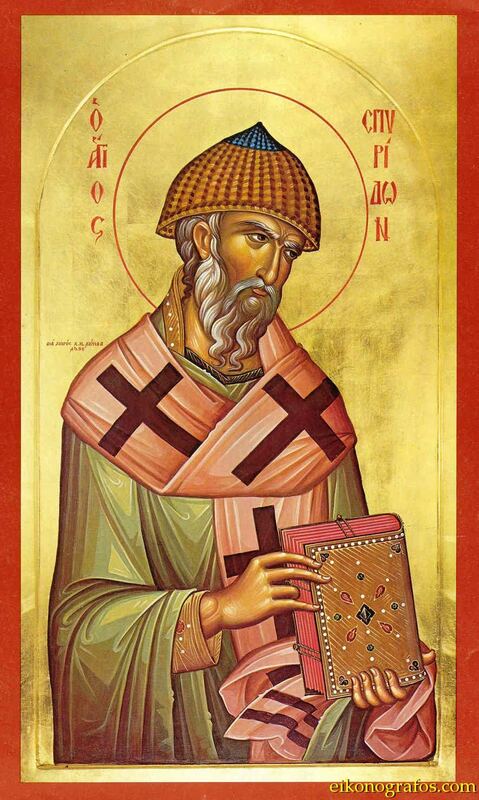 Was Saint Spyridon a married bishop, or had his wife been taken to the Lord while young in life? There are arguments on both sides. What is important is that we do have rules and canons today regarding the present and future election of the hierarchy. These must be respected, having been developed both through the experience and suffering of the Church, and under the guidance of the Holy Spirit. In the instance at hand, what concerns us is not how long Saint Spyridon’s wife lived, but rather the holy life which the saint himself led, together with his deeds and teachings. While living the quiet life of a shepherd, the saint developed the practice of offering help to anyone in need. He used his own limited finances to give rest to travellers and food to the hungry, in obedience to the Gospel command and the true spirit of Christianity. It was during this time, while he was living an obscure life in a remote region, serving God and his neighbour, that we begin to hear of miracles being worked through him. Our Lord said that no one lights a lamp and places it under the table; no, the light must shine for all to see. Spyridon’s humility, piety, love for God, and compassion for others would be an example for thousands throughout the centuries to follow, but first, this holy man had to be known beyond the limited bounds of the island of Cyprus. Attention was brought to his God-pleasing way of life through the miracles which were attributed to him. A miracle is an action of God. In our earthly, limited, human reasoning, the curing of the fatally ill, the changing of a substance into something totally different, the submission of wild beasts, or the mastery of the elements are all termed as “miracles.” But all of these actions are natural to God, the Creator, who gives life to all, who “spoke and it was created,” who walked upon the waters. God often works these deeds through the humble saints who are pleasing to Him and in whom He dwells. They, in their piety, do not attribute these actions to themselves, rather, they regard these miracles as exactly what they are: the works of God. Saint Spyridon proved to be such a vessel for God’s works, for he lived in accordance with the words of Saint Paul, “I live now not with my own life but with the life of Jesus Christ who lives in me.” (Gal. 2:20). The early miracles worked through this saint include the healing of many who were incurably ill and, by his word alone, driving demons out of those who were possessed. God is not the god of sickness or suffering, nor can any evil spirit endure His presence. It was enough for just the shadow of Saint Peter the Apostle to fall upon the sick man to heal him. Surely the presence of God in Saint Spyridon who had given himself totally to the Creator and Saviour, could work the deeds of healing and driving off demons. As these deeds and the holiness of his life became known, Spyridon was called to serve the Church in the ranks of the episcopacy. He was consecrated as Bishop of Tremithus near Salamis during the early fourth century. The qualities which had made him a loving and compassionate pastor of sheep were the same virtues which made him a worthy shepherd of the flock of Christ: he vigilantly watched over the clergy and faithful, feeding them through his preaching, leading and guiding them to the green pastures of the faith, driving off the heretical Arius who threatened to devour the flock like a wolf, and constantly seeking out those who had strayed. The wonders worked through this holy man continued and multiplied after his ascent to the hierarchal throne, for although now burdened with administrative duties, his love for God and devotion to prayer continued to burn within him. 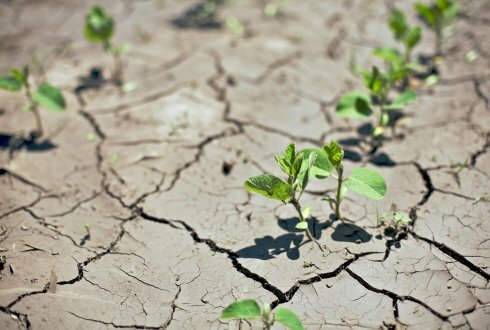 During the early years of his episcopacy, a terrible drought engulfed the island of Cyprus. Crops were threatened with complete ruin, plants withered, famine and death were close at hand. The people knew that only someone whose prayers were as powerful as those of Elijah could move God to open the heavens and loose their storehouse of life-giving rain. Saint Spyridon proved to be the one needed. 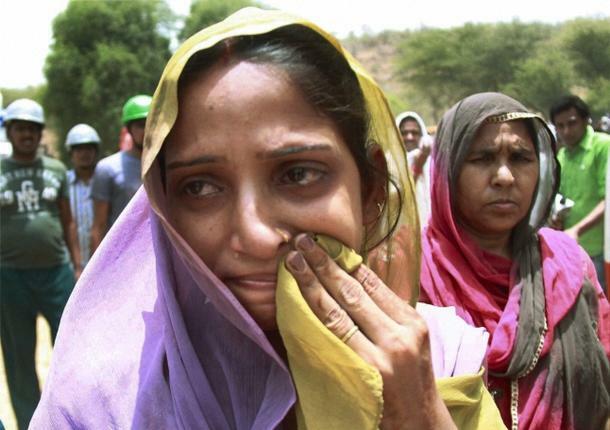 He saw the disaster threatening the people and was moved to mercy at the sight of their hunger. He prayed to the all gracious Lord; at once, the skies filled with clouds from the ends of the earth. No one could say that this was a natural occurrence, for the clouds strangely held their position for a prolonged time without releasing a drop of water. The saint again prayed fervently. Then, and only then, did the rains pour down upon the earth. The rain continued for many days until the saint again prayed and the skies cleared. 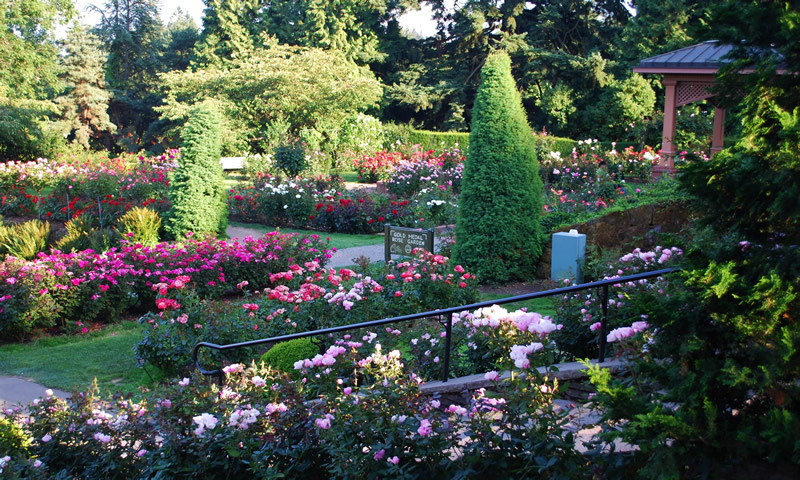 The land had been watered in abundance, plants emerged from the soil and bore fruit. After the drought there was enough food to feed the people, through the prayers of Saint Spyridon. A few years later, famine again threatened the region. The wheat vendors, who had stockpiled grain throughout the years saw the impending disaster as an opportunity to grow rich. 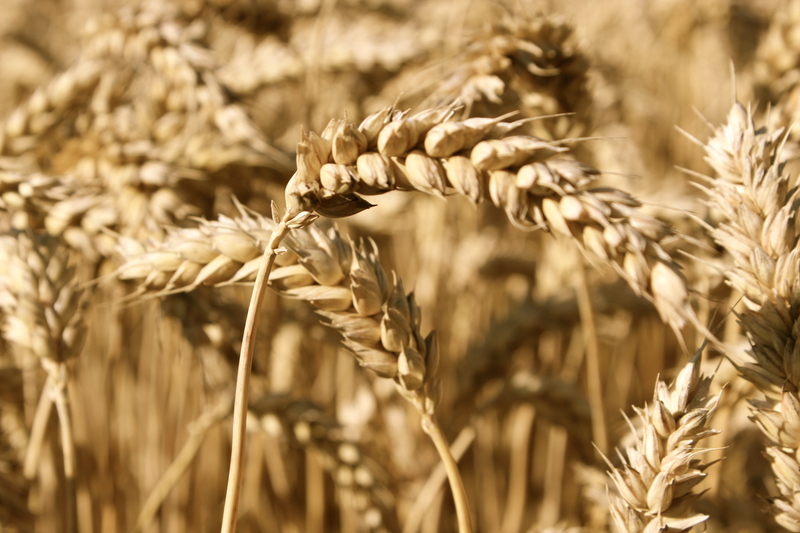 They opened their granaries, selling their wheat at high prices. In the city of Tremithus there was one particular vendor who was extremely greedy. He purchased wheat from other regions at a low price, shipped the grain to Tremithus and then refused to sell it at a reasonable sum. Instead, he stored all of it in his granaries until the famine grew worse and the other vendors’ granaries were emptied. Then, he offered his wheat for sale at exorbitant rates, seeing this as his opportunity to grow wealthy. The famine grew more severe daily, and the vendor’s pockets continued to fill with money from the poor and starving. The poor man went away dejected for he thought the saint was just saying these things to comfort him. That night, by the will of God, the skies again opened and torrential rain fell. The granaries of the greedy vendor burst open and the flood of rain swept the grain away, leaving it scattered widely where it could be easily gathered by those in need. The miserly man ran throughout the city, frantically asking everyone to help him gather up his grain so that he would not lose his source of wealth. The impoverished people, who had been on the brink of starvation because of his greed, saw the grain all along the roads and fields. Faithful as they were, they saw the hand of God clearly in this turn of events, for He fulfills the needs of those who love Him. Everyone turned out and gathered up the wheat, each filling his own house with all he needed. Among those who gleaned the wheat from the roadside was the poor man who had asked for help the very day before. When the rich vendor saw him, he began to beg him to give him some of the grain which God had taken from him. The very words which the Holy Spirit had spoken through Saint Spyridon were fulfilled as God punished the vendor for his lack of mercy and comforted the poor man for his humility. The poor farmer, on hearing this, went to Bishop Spyridon. He wept before the bishop, telling him of his impoverished state. He was not seeking financial help from the saint, only comfort, for it was well known that the Godly bishop lived the same modest life as the faithful of his diocese and certainly had no riches. Whatever he did have, he always gave to those in need, keeping for himself only what was necessary for life. Spyridon spoke to the farmer with encouraging words, then sent him home. The next day, however, the bishop went to see the poor man and, much to the farmer’s surprise, gave him a wade of gold. The poor man took the gold from the bishop’s hand and hurried to the rich vendor. The vendor rejoiced at seeing the gold, since he loved money more than anything else, and he immediately loaned the grain to the poor man. When the famine passed and the harvest was completed, the farmer returned the promised amount of grain to the rich man, receiving back the gold. Then he gratefully hurried to Saint Spyridon. God’s miracles are worked not only through the humble, but also for those who are humble in heart for their salvation. Saint Spyridon had no desire to keep the gold for he was known as one who had no wish to acquire earthly riches. Truly, through this miracle, the poor farmer beheld how strong the power of prayer is and how dearly God cares for those who love Him. When the saint spoke these words, at once the river stopped its flow and created a dry path for the holy man and those who were with him. Among his companions, one ran ahead of the saint to the judge to announce the arrival of the holy hierarch and the miracle which had occurred on the way. When the judge heard of this, he recognized it as the will of God whose judgments are just, and admitted that he had truly condemned an innocent man, for this miracle would not have happened if the man had been guilty as accused. He then immediately set the imprisoned man free and delivered him to the saint, unharmed and in good health. As we have seen in the miracle worked through Saint Spyridon for the poor man in need of wheat, the holy bishop had the gift of foresight, knowing beforehand of things which would take place. Sins which people hid and refused to confess were also revealed to Saint Spyridon by God. She begged him not to be repulsed by her, but, in her stubbornness, did not confess her sin. Surely, she had had numerous opportunities to confess and amend her ways, but had refused to do so; yet how great is the mercy of God who does not desire the death of a sinner! She, who had not sought the mercy of the Church, was, through God’s will, now found in the presence of a gentle, yet firm and uncompromising, spiritual father. Since it is only through acknowledging and confessing one’s sins that God grants remission, the saintly bishop, in his care for her soul, wanted her to admit her lustful actions and thoughts. At those words, she tried even more to approach and touch his feet to wash them. Spyridon sighed deeply for her soul which was on the brink of perdition, and in his gentleness and love for man, he openly reproached her. Like the Lord speaking to the Samaritan woman, the bishop spoke clearly of all her sins and urged her to repent. She was both amazed and afraid, for she could see that her hidden actions and thoughts were visible to the eyes of foresight which the holy servant of God possessed. Overcome with shame, and her heart finally humbled, she fell at the bishop’s feet, washing them, not with water, but with tears as she confessed her deeds aloud. The parallel of this incident with that of the Gospel account from Saint John is striking. Through the laying on of hands of apostolic succession, the power which the Lord had bestowed upon the apostles to forgive sins had also been granted to this holy bishop. From that hour the woman corrected her way of life and was an example to others. Saint Spyridon, like so many other bishops, had also been subjected to such tortures and mutilation. One account states that one eye was cut out and the calf of his left leg severed. Again, Eusebius’ History of the Church affirms that such was, indeed, the practice for a time under Diocletian when ‘tired of killing, satiated …with bloodshed, they (i.e. the emperors) turned to what seemed to them kindness and humanity …It was not in good taste, they said, to pollute the city with the blood of people of their own race …Orders were then issue that eyes should be gouged out and one leg maimed.’ Not content with merely persecuting the young Church from the outside, the devil also fought then, as now, against the Faith from within. Heresies had arisen in the Church from its earliest days. Many of the false teachings faded away quickly, others were rooted out in time. But, with the coming of Constantine and peace descending on the Church from without, a cancerous heresy threatened it from among its ranks, — Arianism, which proclaimed that “there was a time when the Son was not,” thereby making Jesus Christ, the Son of God, unequal to the Father. This was the most serious of the heresies which had arisen in the Church up to that time. Its adherents were numerous and threatened to completely split the Church. It was the discord aroused by Arianism which led to the gathering of the First Ecumenical Council. 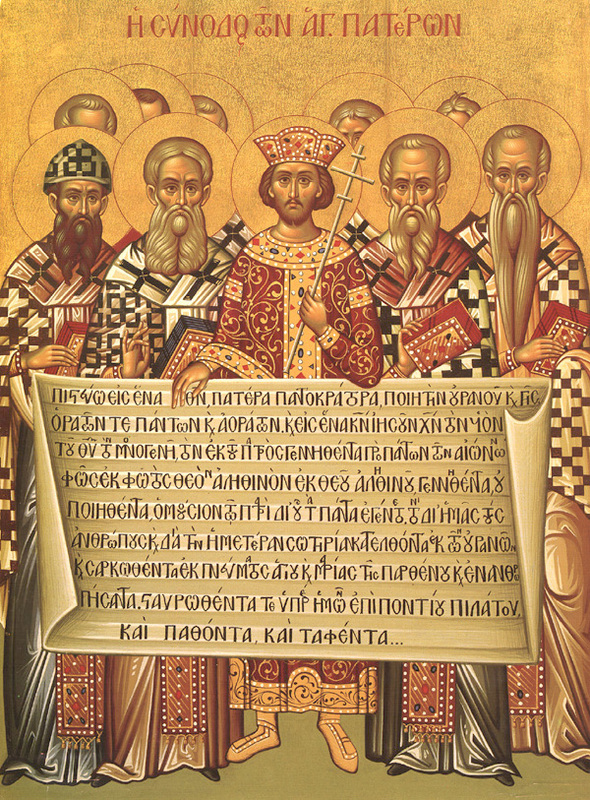 Of all the local and “great” councils which articulated the Faith, the council held in Nicaea in 325, summoned by Constantine the Great, is probably the best known. It was the first to be held under conditions of political freedom for the Church. It must also have been the most impressive, for this gathering of bishops and leaders of the Church was a visible witness of the sufferings which the Church had endured under persecution. How many of the fathers, like Saint Spyridon, arrived at Nicaea maimed, bearing the wounds and fresh scars of tortures endured for the Name of Christ! The bishop’s fame had spread far beyond the small island of Cyprus, and those who sided with Arius were looking for a way to keep him from attending the Council. Even though the bishop was relatively unlearned in the formal sense of the word, the miracles worked through him were well known and the Arians feared that his deeds would influence the decisions of the more educated fathers. When Spyridon, paused in his journey to rest for the night at an inn, the Arians came under cover of darkness and decapitated both of the horses who were to pull his carriage. When dawn came and Spyridon’s companions saw what the heretics had done, a servant ran to tell the bishop. Saint Spyridon put his hope in the Lord and told the servant to go back and put the horses’ heads back on their bodies. The servant went quickly and did what he had been told, but in his haste, he placed the head of the white horse on the body of the black horse, and the head of the black horse on the body of the white horse. At once, the horses came to life and rose to their feet. The saint gave thanks to God, got into his carriage and continued on his way to the council. All the people who saw this were amazed, for the black horse had a white head, and the white horse had a black head! Best of all, the wicked scheme of the heretics failed and the saint arrived at the Council where he proved to be a great defender and teacher of the Faith. As the Council convened, the Orthodox fathers urged Arius to confess that the Son of God is of one essence with God the Father. Those who supported Arius included several very important bishops, among whom were Eusebius of Nicomedia (not to be confused with Eusebius the bishop of Caesarea), Marius of Chalcedon and Theognius of Nicaea. These men accepted the foolishness of Arius, blaspheming that the Son of God is a created being. Those who fought for the True Faith included Alexander, who is numbered among the saints in the Church, but who, in 325, was still a priest and had been sent to Nicaea as a representative of Saint Metrophan, Patriarch of Constantinople, who could not be present due to illness; as well as Saint Athanasius who was then serving as a deacon in the Church of Alexandria. Athanasius’ theology and defence of the Faith were sound, as were the statements made by Alexander, but because of the fact that these men were not bishops, their wisdom in the Faith was a source of particular shame to the Arians. The grace which worked in Saint Spyridon proved to be more powerful in clarifying matters than all the rhetorical knowledge which the others possessed. At the invitation of Emperor Constantine, there were a number of Greek philosophers who were called “perinatitiki” present at the Nicaean Council. Among these philosophers was one who was very wise and adept, and, a supporter of Arius. His sophisticated rhetoric was like a two edged sword which cuts deeply. He boldly attempted to destroy the teaching of the Orthodox. Saying this, Saint Spyridon made the sign of the holy Cross with his right hand while holding a brick in his left hand, and he said, “In the name of the Father and of the Son and of the Holy Spirit,” while squeezing the brick. At once, flames rose into the air, water poured down upon the ground and clay alone remained in his hand! Then the philosopher accepted the Christian faith, rejoicing that the saint had overcome his own logic. All the faithful were glad, and the Arian heretics were at a loss. Saint Spyridon like all the saints, was not seeking his own glory; he was willing to sacrifice everything, even his very life, for God. When the Council at Nicaea ended with Arianism condemned, each of the fathers returned to his home to bring the results of the proceedings of the Council to their flocks and to resume their roles in shepherding the flock of Christ. During the time he had been away at Nicaea, Saint Spyridon’s daughter, Irene, had died. She had never married and was still in the beauty of youth when God called her to the heavenly bridal chamber. Everyone present heard the voice of the dead woman clearly and were filled with awe at this miracle. The saint returned to his house, found the gold in the very place where his daughter had said she had hidden it, and gave it to the woman. Like any father, Saint Spyridon had been saddened by the death of his child, but as one who loves God, he accepted her earthly departure as the will of the Lord. It was his love and compassion for the poor woman alone which made him call upon his daughter to answer him from the other side of the grave. It is also interesting to note that there is no mention in this account of Spyridon’s wife. Thus, if she had still been living at the time of his elevation to the episcopacy, she had, most likely, already been taken to the Lord by the time of the Council of Nicaea; for, had she still been alive, the woman mentioned in the above account would surely have entrusted her valuable belonging to the wife of the bishop, not to a young daughter. 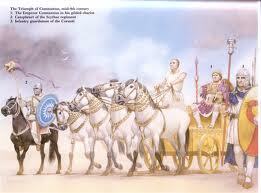 After the death of Constantine the Great in 337, the empire was divided among his sons. The eastern part of the empire fell to the middle son, Constantius. At one point, while he was in Antioch, Syria, emperor Constantius became gravely ill. Doctors were summoned, but none could cure him. The suffering king turned to God and fervently prayed that he be cured of the disease from which he suffered. One night he had a dream. An angel was leading a group of bishops toward him. The angel pointed out two of the bishops who appeared to be advisors of the others, and he told Constantius that these two could heal his disease. Upon awakening, the king thought of what he had dreamt, but he did not know the identity of either one of the bishops whom he had seen in his dream. How, after all, could he identify someone he had never seen, especially when he did not even know their names or homelands’? In fact, one of those whom he had seen in the dream was not yet a bishop, although he would be consecrated soon. Constantius was confused by this dream for quite some time; then, under counsel, he called a gathering of bishops from all the area surrounding Antioch and searched among them for the two whom he had seen in his dream, but in vain. Again, Constantius summoned bishops, this time from more distant regions, but he still did not find the two whom the angel had revealed to him. Finally, he sent out an order that all the bishops from throughout his empire were to come to Antioch. This royal edict reached the island of Cyprus and was brought to Tremithus where Spyridon was bishop. It was not a surprise to the holy man that he was called to Antioch; God had revealed to him all which had taken place regarding the emperor’s disease and the dream which he had had. Thus, Spyridon left for Antioch, taking Triphilius, who was not yet consecrated a bishop, with him. They reached the city and went straight to the royal palace. It had been a long journey and they were both tired. 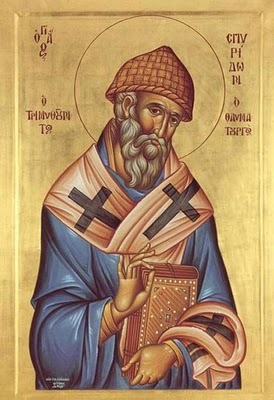 Saint Spyridon was dressed in simple clothes, carrying a fig bough as a staff, and he also bore a small clay stick on his chest, as was the custom of those living in Jerusalem as a symbol of the Holy Wood of the Cross. Certainly, his appearance was not that of a bishop. He and Triphilius arrived at the palace unannounced and without any pomp or entourage. As they approached the entrance, one of the servants looking at his simple garb and humble appearance, took Saint Spyridon for a beggar; he laughed and made fun of him, refusing him entrance, and then even slapped the bishop on the cheek. Then Spyridon who had silently submitted to all this humiliating treatment, obeyed the Lord’s command and turned the other cheek to the servant. The man, himself a Christian, at once realised that this was no beggar, but a fellow Christian and, indeed, a bishop, whose unkempt appearance was due to exhaustion after a long and arduous journey. He was ashamed of his arrogant behaviour and humbled himself before Spyridon asking for forgiveness, which the saint at once granted. Bishop Spyridon was then brought before the emperor. When Constantius saw him and Triphilius, he realized that these were the men whom the angel had pointed out to him in his dream. 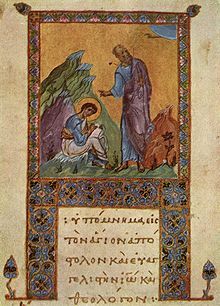 He did not wait for Spyridon to come to him, but arose from his chair and approached the holy bishop, falling before the servant of God and begging him with tears to pray to God that he be healed of the illness which threatened his very life. Constantius’ faith, his humility before the humble bishop who was a true servant of the eternal King, and his trust in God’s mercy were rewarded. Saint Spyridon touched the emperor’s head and the Grace of God, which moves and works through those who serve Him, healed Constantius. The cure was immediate and complete. We can but imagine the relief which the emperor must have felt, as well as his respect and reverence for this simple bishop from Tremithus. All the wealth and power of the empire, his access to the best of physicians, had been futile in attempts to grant him health. Having suffered for so long and lost all confidence in the medical knowledge of the most adept physicians of that time and place, he had humbled himself and put his trust in God. 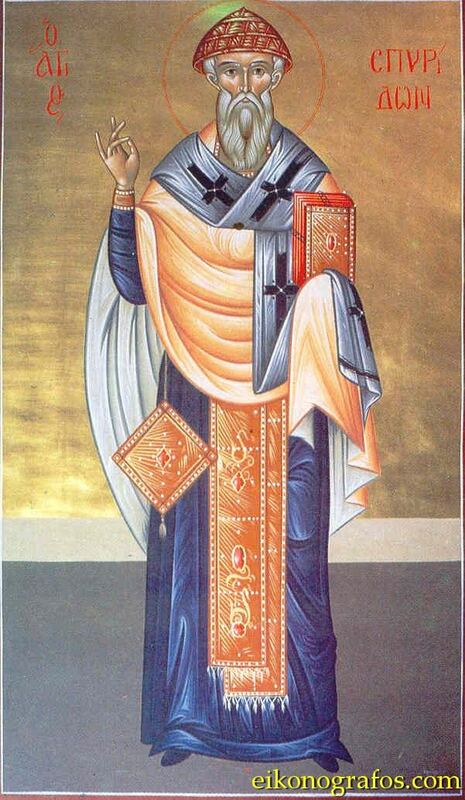 Constantius recognised the sanctity of Saint Spyridon and insisted that he remain with him for the rest of the day. In celebration of his restored health, a banquet was offered and Constantius let everyone know that God had healed him of his disease, through the prayers of Saint Spyridon. Triphilius meanwhile, was in awe at all the royal glory: the beauty of the palace, the pomp surrounding the emperor, the objects which were gilded in gold and the elegant clothes which even the servants wore. Certainly, he had not been accustomed to anything like this among the villages and peasants of Tremithus! Then Bishop Spyridon turned to the emperor; his body had been healed, but there was also a need for treatment to be given to his soul. The saint instructed Constantius at length to turn his thoughts more toward God who always shows His good will for mankind. He encouraged the emperor to strive for these same virtues: to be kind to those under his authority, merciful to those who err, a ready mediator to those seeking his aid, generous to all who appeal to him for help, a father to all, gracious and condescending to everyone. The emperor listened to Spyridon’s words and heard that if someone does not govern according to the manner which the saint described, he may readily be known as a tyrant and not a king. Finally, Spyridon taught him to be firm and correct in matters of the Faith and to refuse anything which would be harmful or contrary to the Church of God. In these instructions too, perhaps, we see an example of Spyridon’s gift of foresight. 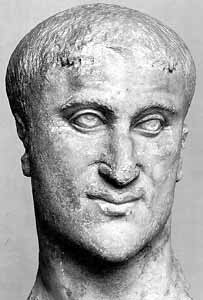 The name of Constantius, son of Constantine the Great, is most often associated with those sympathetic to the Arians. It is true that, years later, after Constantine II and Constans were destroyed, and Constantius was sole ruler of the entire empire, he allowed himself to be swayed and sided with those who supported Arius. He would forget the words addressed to him by the humble bishop whom God had sent to bring about his cure. Unlike his father, he would prove to be weak and ignorant in matters of the Faith, easily influenced politically, an opportunist, and would grossly exaggerate his position in the Church. However, at the time of the above incident, he shared the rule of the empire with his two brothers and had not yet given himself over to siding with the Arians who continued, in spite of the decisions of Nicaea, to spread their heresy. Constantius was truly grateful for all which Spyridon had done for him and wanted to show his thanks in the way which was, and often still is, customary among those who still think in earthly ways: he offered the bishop a large amount of money. Still, the emperor also wanted to make an offering in his gratitude and kept insisting. Finally, the saint accepted the money, but on the condition that it be distributed at once to those in need. Constantius agreed, and it was only then that he allowed the priests, deacons and all the servants of the Church who had been present, to leave the palace. He had learned many valuable lessons from the holy and simple peasant bishop from Tremithus, among them was the fact that it is unfit for the servants of the immortal King to pay tax to a mortal emperor. Sadly, he would later push to the recesses of his memory the other Christian teachings which Spyridon had expounded. Saint Spyridon left the emperor’s palace. There was no need for him to remain in Antioch. He had a flock of faithful at home who were in need of his care, so the long journey by land and sea back to Cyprus began. Along the way he was welcomed into the home of a Christian who had a deep love for Jesus Christ. While he was there a pagan woman came in. This woman did not know the Greek language, but she approached the saint, carrying the lifeless body of her son who had just died. She laid the boy at Saint Spyridon’s feet, weeping inconsolably. No one present understood the language which the woman spoke, but there was no need for words – her tears spoke clearly for she was imploring the saint to grant life to her son. The bishop was moved by the deacon’s compassion for the woman. He wept and prayed fervently to the Lord. The same God, who, through Elisha and Elijah, gave life both to the son of the woman of Sareftha and the son of the Shunnamite woman, now heard Saint Spyridon’s prayer. The spirit of life returned back to the dead body of the child. He awoke as if from sleep and began to cry. At this, the child’s mother was so overcome with emotion that the shock proved too great for her: she died, for it is not only sorrow and grief which can kill a person, but there are also times when immeasurable joy and relief can do the same. This was exactly what happened to the distraught mother when she saw her dead child brought back to life. Again, the saint asked the deacon, “What should we do?” and he again answered the bishop as before. Once more, Spyridon turned to prayer, raising his eyes to heaven and lifting his mind to God who breathes life into the dead and whose will alone created all things. The woman opened her eyes, rose to her feet and picked up her crying child. Then the saint spoke to the woman and all who were present, telling them firmly not to relate what had taken place to anyone. Those who had witnessed these things did indeed keep their silence, respecting the bishop’s wishes; it was not until after Spyridon’s repose that deacon Artemidorus spoke of the miracle which he had witnessed, for he was unable to keep silent about the glory and might of God which had worked through His beloved servant Spyridon. People are sometimes skeptical when they hear of miracles which are worked through the saints. There is probably no other miracle which arouses skepticism more than that of the dead being returned to life through the prayers of a saint. Some will hasten to say that the individual probably was not really dead. Even if that were the case, how does one then explain that the signs of life return only after the saint prays, touches and/or commands? Indeed, God gave us a reasoning mind and intelligence, but there are times when He asks us to believe on the basis of faith, and not on the basis of tangible proofs or rationale, for our comprehension is limited, while the actions of God are boundless. His rule is over all creation, for all are the works of His hands. Saint Spyridon on being elevated to the office of a bishop, never abandoned his humble beginnings as a shepherd, nor his love for animals. Following the example of Saint Paul the Apostle, he strove to provide for his own needs through his labours. A shepherd in his youth, he continued to keep a flock of sheep and goats even after ascending the hierarchal throne. A farmer once came to him to buy one hundred goats from his flock. The saint told him to lay out the agreed price and they would then go and take the number of goats he had paid for. The farmer silently counted out enough money for only ninety-nine goats, hiding the fact that he was not paying for one. Saint Spyridon trusted the farmer’s honesty and did not feel that he, too, should count the money. It was known to all that he never checked the amount of payment given for such a transaction, so the farmer assumed that the deed would go unnoticed. After the farmer had set the payment on the table, he and the bishop went off together to the barn to complete the sale. The saint told the farmer to take the goats which he had paid for. The farmer separated one hundred goats from the herd and led them out of the pasture area; but one of the goats, like a good servant realising that a wrong had been done to its master and that his price had not been paid, turned around quickly and ran back into the barn. The farmer caught him and again led him out; again the goat broke loose and went back to the barn. This happened two or three more times, the goat struggling and breaking loose from the farmer and fleeing back to the barn. Finally, the farmer picked him up, placed him on his shoulders and began to walk off, but this time the goat fought furiously, butting the man’s head with its horns, finally throwing itself to the ground and pulled strongly against the rope which had been tied around it. By that time, some people had gathered to watch the spectacle. Everyone was amazed at the stubbornness which the goat displayed. The farmer was truly ashamed that his conniving had come to light, he admitted what he had done and asked for forgiveness. Then he paid the price and again took hold of the goat; this time the animal gently went along of its own free will and, in fact, hurried to its new home ahead of its new master. The above occurrence is amusing, especially to our modern way of thinking and life. 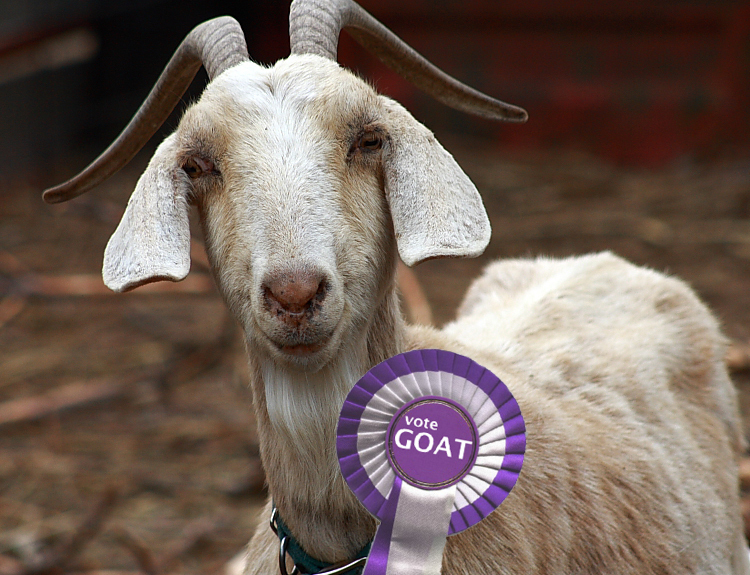 Certainly, goats are known for being obstinate; was this animal behaving according to its own stubborn nature, or was it truly refusing to allow a deceitful action against its master? We know that, before the fall of man, while Adam was still in Paradise, all the beasts obeyed him and submitted to his will. Spyridon’s simplicity as well as his humility and submissiveness to the will of God took him back to that former blessedness so that even the irrational creatures would submit to him. 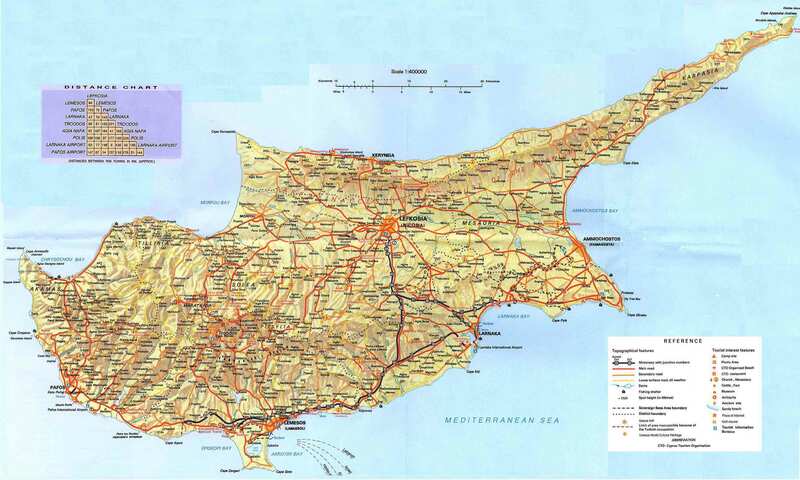 There was a village named Erithras on the island of Cyprus. This village was not far from the Metropolia of Constandius. Saint Spyridon went there one time to see to some affairs and, while there, went into the church. It was the season of the harvest, the weather was extremely hot and the bishop was very tired from the journey. During the service which was taking place, he told one of the serving deacons to abbreviate one of the prayers. The deacon not only ignored what he had been told to do, but instead he prolonged the prayer, chanting and singing with pride, full of vainglory because he knew he had a good voice. At once, the deacon had no voice; not only could he not chant melodiously as before, but he was as mute as if he had no tongue. Everyone in the church was struck by this deed, and word of what had happened spread immediately throughout the village. Everyone came into the church to see what had happened. The deacon fell at the saint’s feet in silence, begging him to loosen his tongue. Others, both friends and relatives of the deacon, also interceded before Spyridon on his behalf. Finally, Spyridon was moved to pity, and forgave the proud cleric. The Lord who gave the Apostles the power to ‘bind’ also bestowed on them the power to ‘loose.’ The saint forgave and blessed the deacon, allowing the power of speech to return to him, but he left a sign of reproach on him because of his disobedience and pride: even though the deacon could speak, he no longer had a strong voice; instead, he stuttered, falling over his speech, and the source of his pride, his singing voice, no longer existed. The sound of the voices was sweet, surpassing any melodic song of man. The deacon who was saying the litany was motionless with fear, for he heard the same divine voices responding “Lord, have mercy,” to each of the petitions. These voices were heard not only inside the church, but even outside. Everyone who heard hurried to the church to listen to the beautiful music. Many drew near the door of the church and heard singing, the likes of which they had never heard before or even imagined. As they opened the door and went inside, they saw no one except the bishop and a few clergy. After the people were inside, the heavenly voices were no longer heard, for now it was the role of the faithful to chant the responses in honour and petition to God. Another time the saint was standing in church during Vespers and there was not enough oil for the lamps. The bishop could see that the flame was about to extinguish. He was upset by this, for that was the only light in the church; without it the church would be dark and the hymns for Vespers would have to cease without the service being completed. But God, who fulfills the desires of those who revere Him, poured oil into the lamps, just as He once filled the widow’s jar during the days of Elisha. The clergy who were serving brought out jars and placed them under the oil-lamps to be filled with the oil which overflowed from the lamp. They filled the jars with the blessed oil which flowed as a true gift from God. A sailor who lived in the city of Tremithus was out to sea for twelve months, transporting a shipment. 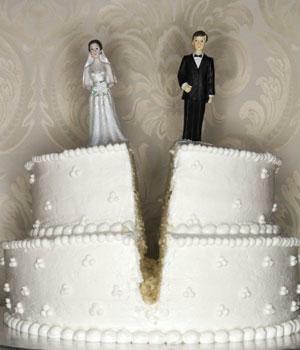 During the time he was away, his wife committed adultery with another man and conceived a child. When the sailor returned home, he found his wife pregnant and knew that she had sinned with someone else. Filled with rage, he struck her; then, not wishing to live with her any longer, he sent her out of his house. After that, he went to Bishop Spyridon telling him what had happened and seeking the bishop’s advice. The saint was upset, both at the sin which the woman had committed as well as her husband’s revulsion. He sent someone to call the woman to him so he could speak with her. When he saw her he did not have to ask if it was true that she had committed adultery — anyone could see that she was with child. Bishop Spyridon said to her, “why did you take another man in place of your husband and bring such shame on your house?” Now the woman added another sin to the one already committed: she lied, saying that she had not been with another man, but that the child in her womb was fathered by her own husband! When the bishop heard this he became truly angry. Forgiveness and compassion are always at hand for those who recognise and repent for whatever sin they commit, but one cannot be absolved of a sin without first acknowledging it. Instead of finding the woman repentant and seeking the reconciliation which the Church has to offer, the bishop saw her obstinate and obviously lying. When Spyridon heard her stubborn denial, he was upset more by her refusal to confess than for the very sin of adultery which she had committed. Still, the woman remained obstinate, saying that the child in her womb was waiting for its father to return from sea before being born. She added even more lies to this, trying to convince everyone of her foolish explanation. When she saw that no one believed her, she began yelling and behaving completely irrational, as if she had been unjustly accused. The woman left the bishop’s presence, still holding to her story that the father of her unborn child was her husband and no other. But the words spoken by the saintly bishop proved to be prophetic: when the time for the birth drew near, the woman was in indescribable pain, yet the child would not leave the womb. Even then, her heart remained hardened and she stubbornly refused to confess her sin. In this terrible state of denial and pain, she died, not being able to give birth. Having recounted the events of one who refused to listen to the words of Bishop Spyridon we will now relate what happened to someone who did take his words to heart and obeyed them. There was a faithful and God-loving woman named Sophronia in the bishop’s diocese. In all ways, she led a truly Christian life, but there was one circumstance in her life which disturbed her peace of soul — her husband was an unbeliever, worse yet, he followed pagan beliefs and rituals. The woman, in complete trust and faith, went to Bishop Spyridon. She explained her situation and begged the gentle bishop to help her bring her husband to the true faith. Her husband had a friend who lived very close to the bishop’s residence and who revered and respected Spyridon a great deal. They often visited each other’s homes, quite a normal thing for friends to do. On one such occasion when a number of the neighbours were gathered together and enjoying a meal together, both Saint Spyridon and the unbelieving man were present. The servant assisting at the table went and found the messenger exactly where the bishop had said he would be. He told him what Spyridon had said and sent him off. After an hour or more had passed, while all the guests were still at table and the first messenger had not yet had time to arrive back at the sheepfold, a second man, also sent by the same shepherd, arrived. He said that the entire flock had been found. When the unbelieving man heard this, he was amazed at the fact that Saint Spyridon had foreseen all these things, knowing what was in the future as if it were the present. He could not understand that the pure in heart often see things in the spirit, as it is revealed to them by God. He began to regard Spyridon as a god and wanted to honour him as such, the same way the Lyconians once wanted to worship Barnabas and Paul, offering wreaths and animal sacrifices. Then Sophronia, seeing that her husband was ready to listen, took the opportunity to speak to him at length. Having seen the gentleness, humility, love and true presence of Christ in the bishop, the man abandoned paganism and believed in the one true God. He accepted baptism, and from that moment on lived a true Christian life. With all the duties that the office of the hierarchy holds, Spyridon as we have seen, still kept a flock of animals, mostly sheep and goats. His diocese was poor, and the income from his flock served as a means of support for the humble bishop. Often, when the problems of administration and the weight of the spiritual care of his reason-endowed flock of faithful were heavy upon the bishop’s shoulders, he found solace in the simple occupation of feeding and caring for the silent animals, as he had in his youth. These times reminded him of the carefree, peaceful and pleasant days of his childhood when he was a shepherd. Although he often entrusted the animals to other shepherds when his duties called him away, when he was home he continued to look after the flock himself. One night though, thieves came into his sheepfold to steal several of the animals. They snuck in unobserved, separated a number of sheep from the others and were about to run off under the cover of night, proud of the fact that no one had seen them. No one, that is, but God who watches over all, even as they sleep. God’s love for mankind far surpasses our imagination. The Church often refers to various saints as “friend of God;” and just as any friend watches out for and comes to the help of another, so God also comes quickly to the help of those who love Him. When He saw the thieves about to run off with some of the animals from the poor bishop’s flock, He stopped them. The thieves’ hands and feet were held by invisible bonds so strongly that they were unable to move or leave the barn where they remained until morning. When dawn came, the saint went to care for the sheep. There he found the thieves bound by the might of God, with their hands behind their backs and their feet fixed firmly. The bishop saw clearly what had happened. He remained calm, perhaps even slightly amused, at the plight of the would-be thieves; yet, above all, he was thankful to God, and also saw this as an occasion to instruct the criminals. Then, having prayed to almighty God, their bonds were loosed. They left the barn, and, from that time on, never took what did not belong to them. There was a merchant from Tremithus who had the practice of borrowing money from Saint Spyridon in order to purchase wares on his travels. After returning home, he would return what he had borrowed. Because the bishop paid little attention to money, he always told the merchant to put the money back into the box from which he had taken it himself. He never bothered to watch or control the merchant to see how much money he took from the box or how much he returned to it. This practice continued for quite some time: the merchant, with the saint’s blessing, took the money himself and, upon returning from his travels, put back what he had taken, unsupervised. As long as he acted honestly, his business prospered. With the acquisition of money the sin of greed and avarice often follow. 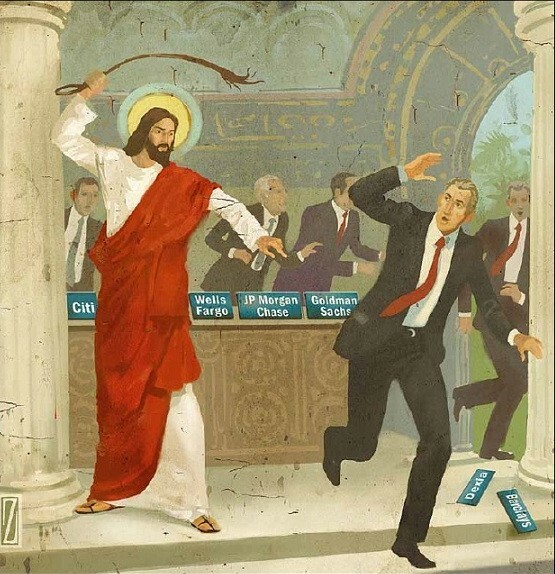 The merchant was finally blinded, like Judas, with love for money, and one time he did not return what he had taken. He kept the secret to himself and lied to the saint, saying that he had put back exactly what he had borrowed, as always. But shortly after this, his business failed: not only did the money borrowed from the bishop not earn him anything, but all his wares were lost in a fire that consumed everything he had. The merchant went, but found no money at all. He faced the bishop empty-handed. The merchant was ashamed of what he had done and humbled himself before the saint, asking for forgiveness. Saint Spyridon at once forgave him and instructed him not to again covet what does not belong to him nor to darken his own conscience with wickedness and lies, for these are the results of one who earns a living dishonestly and are not rewards but punishments. There was once a gathering of bishops in Alexandria, called there by the patriarch of that city, to join in prayer for a special intention. At that time paganism was still flourishing in Egypt and the surrounding land. Idols, carved and fashioned by human hands, were worshipped everywhere. The patriarch believed that the joint prayers of all the bishops would overturn the pagan idols, smashing them to pieces, and thus, the people would see the foolishness of their idolatry, and turn to the One True God. The bishops poured out their most fervent prayers to God, and, indeed, all the idols within the city fell and were smashed, as well as those from areas around Alexandria — all, with the exception of one single, but renowned, idol which remained standing. The gathering of hierarchs continued to pray that that idol would fall too, and that the people would realize the vanity of the objects which they worshipped and turn to Jesus Christ, the Son of God, who trampled down death itself and whose power destroys the pagan gods which are the work of the devil. Still, that idol, the work of the devil, would not fall and the people felt that it was stronger than the Triune God to whom the bishops prayed. The patriarch was determined, and decided to remain in a vigil of prayer all night long. During that time, he had a vision in which he was told that he should not be completely disheartened that the idol was not smashed; instead he was to send someone quickly to Cyprus and call Spyridon the bishop of Tremithus, for that idol was left standing for him, and him alone, to overthrow by his prayers. The patriarch then took his staff in hand and he, together with the other bishops, went to meet Saint Spyridon at the harbor. 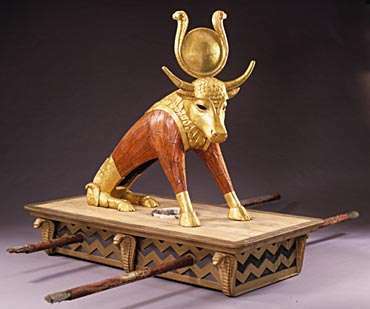 They welcomed him with honours, and everyone celebrated that day both because of the presence of the holy bishop who worked such wonders and for the fact that the last of the pagan idols in Alexandria and the surrounding territories no longer existed. The great historians of the Church, Nicephorus and Sozomen, say that the holy father Spyridon was very firm in adherence to all the rules of the Church, and, in particular, that he would not allow even one word which was written in the Holy Scripture to be changed. We must remember that the Bible was then read in the original Greek and there was no question of what word or nuance best suited a translation. Once the following incident took place: There was a gathering of bishops in Cyprus to see to some of the matters which had arisen in the Church. Among those gathered were both Saint Spyridon and the younger Bishop Triphilius, a former disciple of Spyridon’s. Triphilius was especially adept at understanding the Holy Books for he had studied extensively in his youth and was learned in Scripture. His wisdom and knowledge were respected by his fellow bishops who asked him to preach to the congregation in church one day. As Triphilius was speaking, he mentioned the words which Christ had spoken to the paralytic, recorded in the Gospel of Saint Mark, “arise and take up your bed.” But Triphilius did not use the word ‘bed,’ instead he said ‘mat’. Spyridon was so disturbed that a single word spoken by Christ had been changed that he could no longer even remain in the church. Having said these words to Triphilius, he left the building. This incident should not be seen as an offence. Triphilius had not only been a disciple of Saint Spyridon but he was also very puffed up with pride at his rhetorical gifts. The saint’s words served to teach him some humility, without which all his wisdom and knowledge would be useless in the Church. 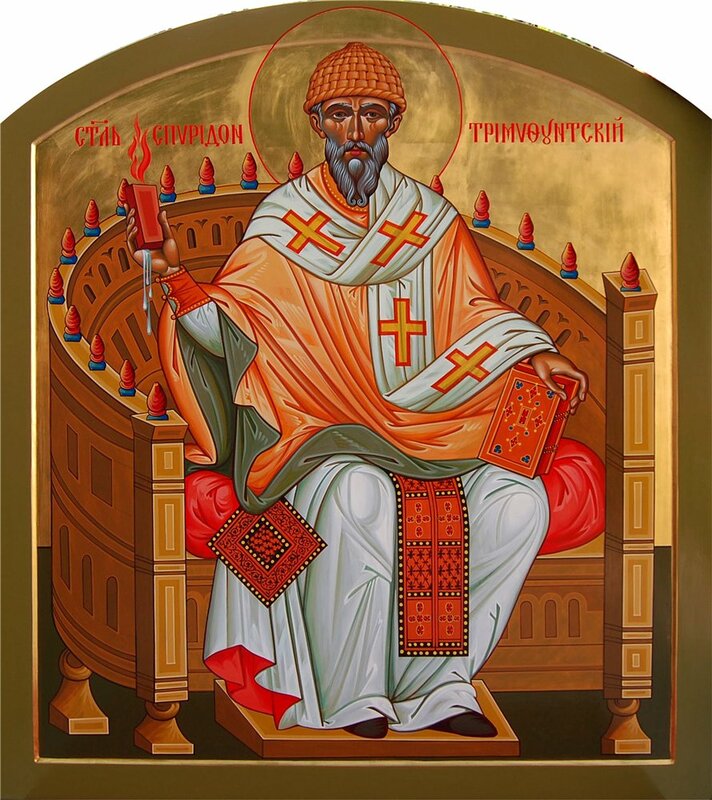 Spyridon was also held in high regard by all the clergy and faithful in the Church for he was both older in years, weaker in body and was known for the fact that the works of God were often manifest through him. While Constantius was still ruling, in the year 347, Spyridon’s labours upon this earth were drawing to a close. He had seen times of Christian persecution and times of peace for the young Church which he served. 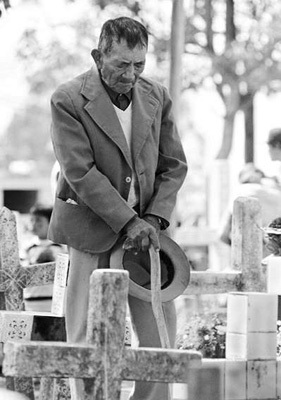 Although advanced in years, he continued to assist with work in the fields, especially during the harvest season. It happened that as he was working in the field one day during the time when the sun was strong and the air dry, the saint’s head suddenly was covered with dew. He had been labouring as though it was his final hour when the dew softly fell upon his head the same way it had fallen on the fleece of Gideon long ago. Many were present and witnessed what had happened. None could say that what appeared was mere perspiration, it was clearly dew which had fallen from above. Suddenly his hair changed: some became white, some turned black, some blond. God alone knows why this happened or what it could have meant. The saint put his hand to his head, then said to those who were there that the time for his departure was near. He spoke to his fellow labourers and spiritual children at length, as a final instruction, exhorting them especially to love God and neighbour. After a few days had passed, while he was at prayer, he gave himself into the hands of God whom he had served justly and in holiness all the days of his life. News of the saint’s falling asleep spread quickly. He was buried in the Church of the Holy Apostles in Tremithus. The gentle and loving leader of the Church did not abandon his faithful flock even after being taken to the Lord, but continued to work miracles after his death. Many people came to pray at his tomb, asking for his intercessions before the Lord. 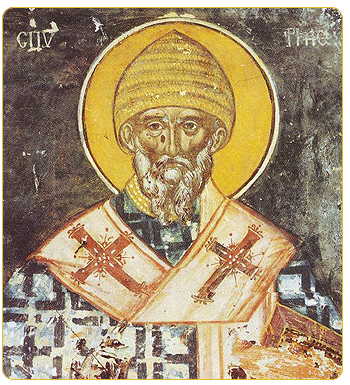 It was not long before the Church, guided by the will of the Holy Spirit, officially included Spyridon bishop of Tremithus, in the official calendar of saints. How frequently we say those words to each other! Indeed, one of the most outstanding features in any church service is how often we pray for others: the sick, the suffering, those in prison, travellers, clergy, laity, those in civil authority …the list goes on. We sincerely trust in the prayers of others, especially those who lead a truly Christian life. We also know that ‘death’ is not an end, but a passing from this temporal life to eternal life. 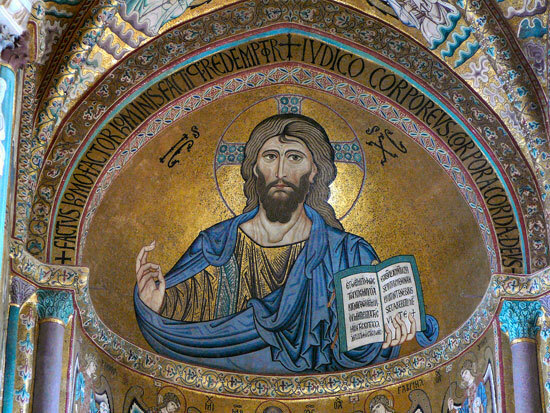 In the Nicene Creed we confess our belief in “One, holy, Catholic (universal) and Apostolic Church.” The Church is One. It is the body of Christ. Just as our Lord is not divided between those on earth and those in heaven, so the Church, His body, is not divided between those who have gone before us to eternal life and those still struggling along the path of salvation here on earth. We ask each other for prayers before the Lord, and so it is equally normal to ask those who stand before God in heaven to also intercede for us. The Psalmist says “Wonderful is God in his saints.” God, indeed, is surrounded by those who led holy lives here on earth. Just as He heard and accepted their prayers during their earthly lives, so He also accepts their prayers now, and answers them. Saint Spyridon loved and prayed for his faithful during his life of ministry to them. His earthly departure did not put an end to his love for those who turn to him for help. We have related here several of the miracles performed through him during his life, but this blessed saint continues to pray for and assist us even now. The body of Saint Spyridon has remained completely intact. 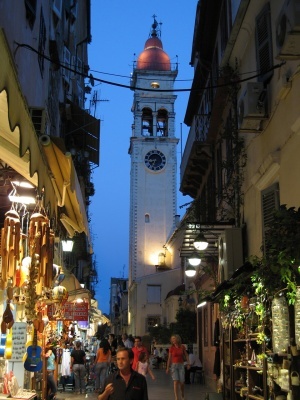 The holy relics are to be found in the church in Kerkyra on the island of Corfu, Greece. Thousands of people come before his reliquary each year to pray for his intercessions and assistance. The miracles attributed to him are countless. One sign of the Saint’s continuing care for the faithful is clear: often when the serving priests in the church open his reliquary, the body is gone. Later, when they open it again, they find he has returned. This is not a rare incident, but happens, even in our own time, repeatedly. Another indication of this miracle is that each year, on the day of his commemoration, December 12, the footwear on his body are completely worn out. The serving priests literally change the saint’s shoes every year, only to find them worn out again the next year. It is often not unusual for the priests, on touching the saints feet as they change his shoes, to find the body pliable and warm, not hard and cold like that of a corpse. The humble bishop who served the Lord unreservedly throughout his entire life, certainly would not want any of these “miracles” to be attributed to him, but would be the first to recognise them as the action of God: Father, Son and Holy Spirit, who receives from us glory, thanksgiving, honour and worship unto ages of ages. Saint Spyridon is one of the most honored saints of the Orthodox Church, whom Christians call upon in situations, as is St. Nicholas, St. George and St. Demetrios. Kerkyra has his precious relics, just as Zakynthos has the relics of St. Dionysios and Kefalonia has St. Gerasimos. He was born on the island of Cyprus, of poor parents. This is why in his younger years he was a shepherd who kept sheep. He was very simple in his thinking just like the fishermen Christ chose to make his disciples. When he came of age, he married, and after some years he widowed, and so great were his virtues that they made him bishop in a city called Trymithounda, even though he was completely illiterate. Receiving this spiritual office in the time of Emperor Constantine the Great, he became even more simple and humble, and shepherded his reasonable flock which Christ entrusted to him with love, though was strict if needed for their salvation. He was a protector of the poor, a father of orphans, a teacher of sinners. And he had such purity and holiness that he was given the grace from above to work many miracles, which is why he is called “the Wonderworker”. With his prayers he would gather the clouds and it would rain on the dry earth, he healed the sick, and he punished deceptive people, as he did with certain black marketers for whom he tore down their storage barns in which they kept the wheat even though the people were dying of hunger, and they were crushed together with the wheat. And despite this he lived in such poverty that when a poor man went to him for help to pay a debt, he had nothing to give him, and by a miracle he made a snake that was in the area into gold, gave it to the poor man, he melted it, and payed off his debt. Another time a cataclysm occurred and the rivers flooded the area, but when St. Spyridon prayed, the waters pulled back and the land that was flooded dried up. He healed also the Emperor Constantius who came down with an incurable illness, a deacon who became dumb he made well, evil and greedy people he punished with supernatural strength, and other innumerable miracles did he also perform so that the lawless and unrighteous may fear him and have him as a protector and refuge. But he always had great love and sympathy towards sinners, which is why when certain robbers went one night to steal sheep from his pen, which he managed in order to help the hungry, they went blind and could not escape, crying out for mercy. The saint did not only restore their sight, but gave them also a ram because, as he told them, they suffered all night, and since he exhorted them to be good people, he sent them back to their homes without letting anyone know of the robbery they wanted to commit. He also foretold things before they occurred with exactness, making the people wonder whether he was a superhuman personality, since from a shepherd he was found worthy to achieve such heights. 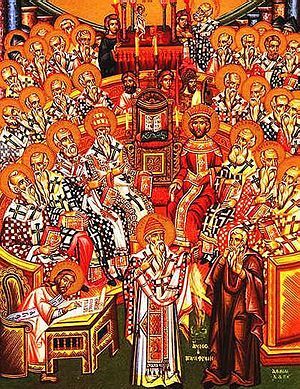 And at the First Ecumenical Synod which took place in Nicaea, St. Spyridon was among the three hundred and eighteen God-bearing Fathers, and though illiterate, he shut the mouth of the heresiarch Arius who was the most learned of all the bishops present. Throughout his whole life he did not cease to perform miracles. The greatest was that of the resurrection of his dead daughter who arose from her tomb and gave witness to the place she had left some money which belonged to another woman, and afterwards she fell back asleep. Another time a woman whose child just died went to the saint, and implored him with many tears to resurrect him, so accustomed were the people to the miracles of the saint. And he resurrected him through his prayers. When the mother saw the child alive, the same died out of her great joy. And St. Spyridon resurrected the mother as well. Word of these great miracles spread throughout the world, and St. Spyridon, while still alive, was honored as a saint and wonderworker. 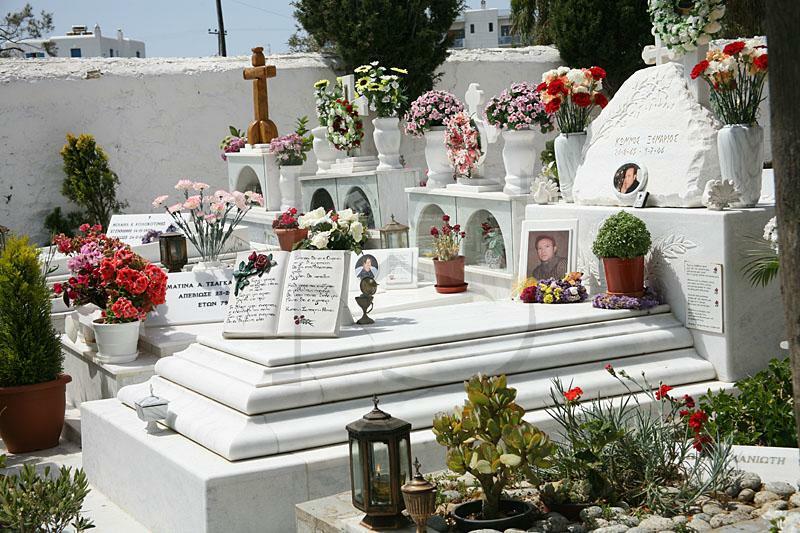 And till this day he works many miracles in his shrine which is the treasure of the citizens of Kerkyra. 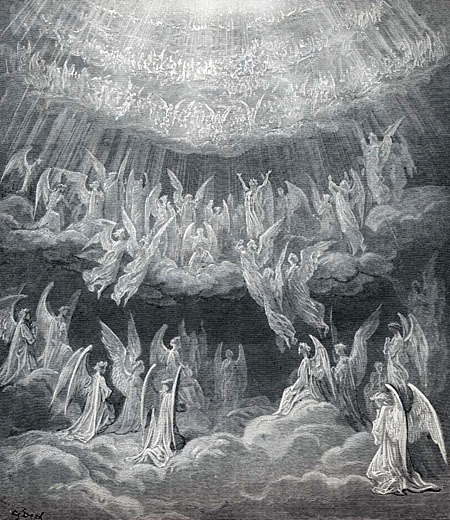 When he liturgized, angels stood around him which many of the pious Christians saw with their own eyes; and when he said “Peace be to all” the Angels responded “And with your spirit” instead of the chanters. And he was showered in supernatural light. He reached deep old age in such an angelic state shepherding his reasonable sheep, and ascended to the Lord. His holy relics for a time remained in Trymithounda and from there went to Constantinople where they placed him in the Church of the Holy Apostles in which the relics of many saints were kept. During the Turkish occupation they fell into the hands of a pious Christian named Boulgari and he with great effort brought them to Albania hidden in sacks, and from there crossed over to Kerkyra in a kayak. The Venetians kept them and since then he is found on that island, untouched by the weather, after all that they have endured 1600 years since his falling asleep. In his kouvouklion the saint stands upright, hands crossed, dressed in liturgical dress, and they bring him out in procession twice a year. 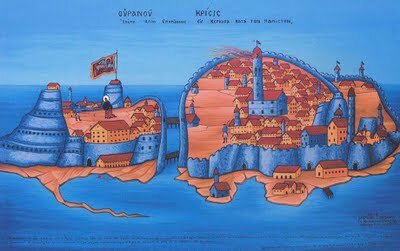 The people of Kerkyra hold his sacred shrine with great reverence and regard it a treasure of their island. During the time that I worked in the Museum of Kerkyra I came to know Papa-Boulgari, who was the parish priest of the church by lottery, a man who loved the arts and learning. The holy relics work wonders always until today to whoever implores the saint with faith. 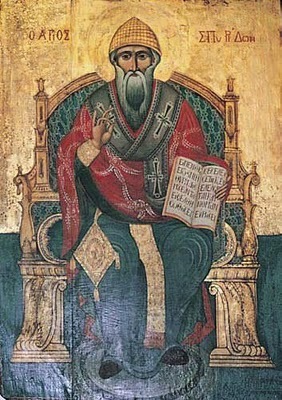 In Orthodox hagiography [iconography] St. Spyridon is depicted in old age with a turned nose and with a forked short white beard, wearing a skoufi. The skoufi is strange, like it is Chinese, pointed at the tip. He is never drawn without a skoufi. Except for icons on planks of wood or in other walls of the church, he is often drawn in the Holy Altar with the other great hierarchs Basil, Chrysostom and Gregory under the Platytera. On the paper which he holds, it is written: “To You we offer this reasonable and bloodless sacrifice”. Our hymnology has decorated him with unwithering flowers, which very few of us have meditated on to see how truly they are unwithering. O Father, God-bearer, Spyridon, you were proven a champion and Wonder Worker of the First Ecumenical Council. You spoke to the girl in the grave and turned the serpent to gold. And, when chanting your prayers, most sacred One, angels ministered with you. Glory to Him who glorified you; glory to Him who crowned you; glory to Him who, through you, works healing for all. You turned a snake to gold, O holy Hierarch, and with your words like cords you stifled Arius who was a wicked and impious heretic, O Godbearing Saint. You, O father Spyridon, made the Emperor well again, and you resurrected the dead, and you drove demons out of men. We therefore come together to honor your venerable memory with hymns of praise. O Father, you beautified the Church of Christ by your words; moreover you honored by your deeds the image of God, O blessed Saint Spyridon, shining the light of virtue in the world by your temperance, flashing the grace of healing over all who entreat you. And therefore with faith we observe your festive memorial. To both rulers and churchmen at the august convocation ingeniously you explained the power of the Trinity in a manner that honored God. They witnessed you proclaiming the single Divinity and dogmatizing clearly that three are in essence one. Therefore by divine inspiration you brought down the wordy philosopher, by the power of the Spirit, O most godly Hierarch. Intercede with Christ our God that forgiveness of offenses be bestowed upon those who with longing observe your holy memory. 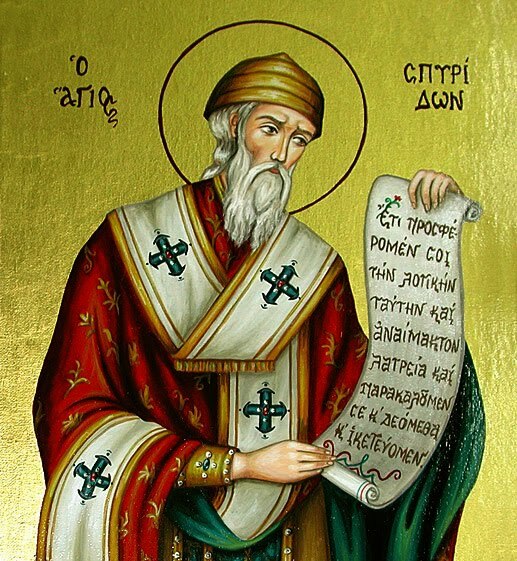 Let us now extol Spyridon, the Hierarch of the Lord, who was sanctified from the womb, who received the tablets of grace and divine glory, who was famous to all by his miracles. He was fervent and an eyewitness of divine illumination, a defender of the poor, and spiritual guide for sinners. He proved to be a faithful Hierarch, offering sacrifices at the altar of Christ, and he earnestly prays that God illumine all. “The island of Cyprus was both the birthplace and the place where this glorious saint served the Church. 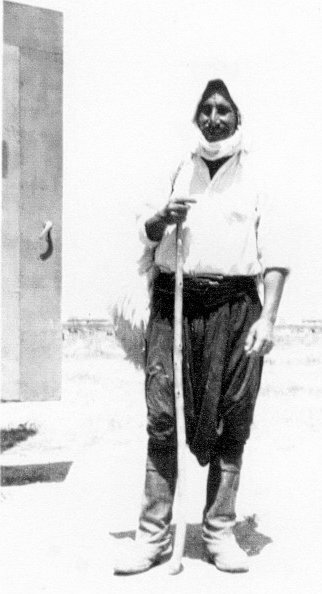 Spyridon was born of simple parents, farmers, and he remained simple and humble until his death. 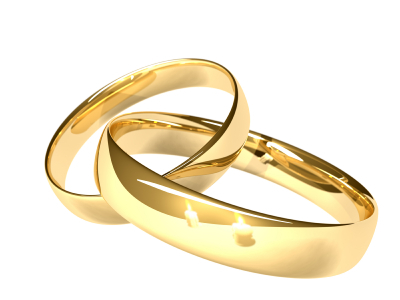 He married in his youth and had children, but when his wife died he devoted himself completely to the service of God. Historical sources that certify the authenticity of the following event on the expulsion of the papal forces from the island, include the historical notes given by a great saint of our Church, St. Athanasios of Paros. We should all reflect upon the message of the following event. In 1716 the Turks had the island of Corfu under a tight siege. They had 50,000 troops and a good number of ships surrounding the island, cutting its lifeline from land and sea. The barbarian armies had been concentrated at the far walls of the city. Pizani, a general of the forces of the Venetian Republic, was anxiously anticipating the oncoming enemy attack (since Corfu and the nearby islands were occupied by Italy at the time). At daybreak on August 11, 1716, St. Spyridon, the patron Saint of the island, appeared in front of the enemy lines holding a glistening sword in his right hand. His austere and grandiose appearance horrified the aggressors who began to recede. The Hagarenes, panic-stricken by the most awesome presence and fearless attack of the Saint, abandoned weapons, machinery and animals, running for their lives. This great miracle became known throughout the island. The Turks had left behind 120 cannons, a large number of weapons, ammunition, animals and food. 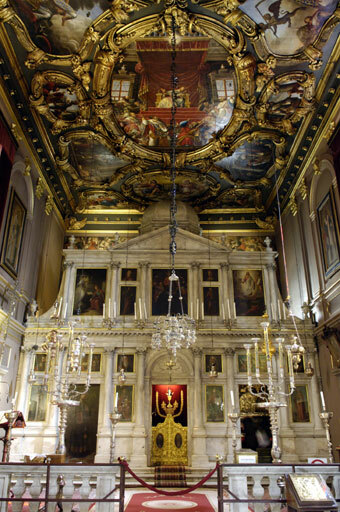 After this powerful, surprising and most obvious miracle, the Venetian ruler Andrew Pizani, who was a Papist, wanted to erect a Papist altar inside the Orthodox Church of St. Spyridon (forever pushing for this was also the Papist Cardinal of the island). However, St. Spyridon appeared to Pizani in a dream saying: “Why are you bothering me? The altar of your faith is unacceptable in my Temple!” Naturally, Pizani reported this to the Papist Cardinal who answered that it was nothing but an evil fantasy of the devil who wanted to nullify the noble deed. After this, Pizani was much encouraged, so he ordered the necessary materials to commence construction of the altar. The materials were piled up outside of the temple of St. Spyridon. When the Orthodox priests of the temple and the Greek leaders of the island realised what was going on, they were greatly grieved. They asked to meet with Pizani to ask him to put a stop to this. Pizani’s response was quite disheartening. He said quite bluntly, “As a ruler I will do whatever I please!” At that moment, the Orthodox community of the island turned their eyes to their Saint, beseeching him to put a stop to this abomination. The next morning, Pizani reported all this to the Papist Cardinal who now accused him of being not only faithless but also of being “yellow”. Again, after this, the ruler mustered up enough courage to order the construction of the altar. The Papists of the island were celebrating their triumph while the Orthodox were deeply grieved. Their grief could not be comforted and with tears they begged for the Saint’s intervention to save them from the Papist abomination. The Saint heard their prayers and intervened dynamically. That evening, a terrible storm broke out, unleashing a barrage of thunderbolts on Fort Castelli, Pizani’s base and his ammunition barracks. The entire fort ended up in a holocaust. 900 Papist soldiers and civilians were instantly killed from the explosion, but not a single Orthodox was harmed (as they were not allowed inside the fort after dark). Pizani was found dead with his neck wedged between two wooden beams. The body of the Papist Cardinal was found thrown a great distance from the fort. But the most incredible fact was that the same night and at the same hour, another thunderbolt struck in Venice, targeting the compound of Pizani, burning his portrait that hung on the wall. Strangely enough, nothing else was damaged. 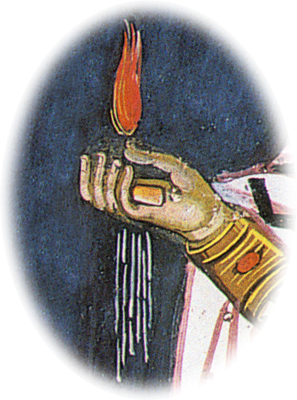 Also, the guard of the ammunition barracks saw the Saint draw near him with a lit torch. He was carried by the Saint near the church of the Crucified without a single scratch. After Corfu’s deliverance from a siege by the Turks, owing to the protection of St. Spyridon the Wonderworker, on 11 August 1716, Andrea Pisani, the governor and general of Corfu, wished to do something in order to thank the saint for his great benefaction concerning the aforementioned deliverance. He consulted a papal theologian, Francisco Frangipani, as to what he should do and what would be best and well-pleasing to the saint. The theologian said that it would be a very good and holy deed to build a precious marble altar inside the Church of St. Spyridon, so that they could perform a Latin Mass inside. He said: “Your Excellency can hear the Mass in your own language when you are present there.” The theologian’s counsel pleased the governor, and he ordered that the materials be prepared at once. However, before the materials were made ready, it seemed appropriate to him to call the priests of that church (where the relics of the divine Spyridon were housed) and find out in what way they could be of assistance. As soon as they heard the unexpected news, they told him bluntly that this was a dangerous innovation, and they wished in no way to help him with his plan. The governor replied angrily that even if they were not willing to help, as the supreme authority he would do as he wished and would command that the materials be gathered outside the saint’s church without fail. So there was gathered together asbestos, plaster, marble, and a slab from select marble, superbly crafted for an altar. 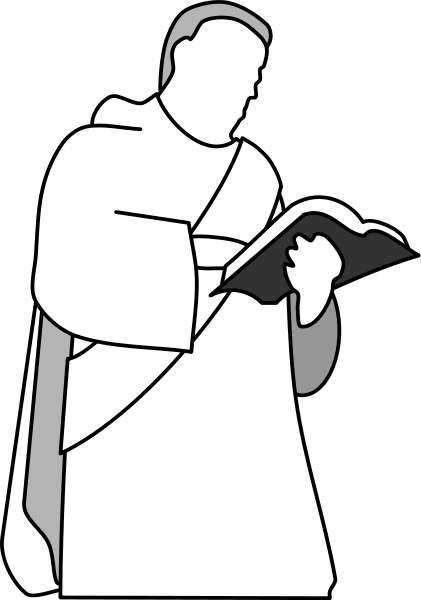 That night in a dream, the governor saw a man in a monastic habit saying to him: “Why are you bothering me, and why are you upsetting my children (i.e., the priests)? Know that what you are intending to do is not in your interest.” At daybreak he called the theologian into his room (that is, the one who gave him the idea) and related to him the dream in detail. The theologian said: “As Christians, we are obliged in no way to believe dreams, nor are we to accept them at all as real. You should certainly consider this, my lord, to be an obvious temptation of the devil, with which the adversary troubles the good, in order to amuse himself and impede such a most-pious deed.” The governor calmed down, fully convinced by the theologian’s words. The governor was filled with courage by these words and as day came on, which was the 11th of November 1718, he went to the church of the saint so as to venerate. He was accompanied by those of his court (along with the city’s engineer) in order to measure the area according to length, width, and height for the construction of the altar. At that time, the oldest of the priests, Marinos Voulgaris Sakellarios, and the priest in charge, Spyridon Voulgaris (the great protopresbyter), stood before the governor and with humble voices begged him not to go through with such a modification, as it might not seem best to the saint. When he heard them, however, he flew into a rage, threatening that if they did not do as he wished and become silent, he would send them to Venice in chains, to be thrown into prison, never again to see the light of day. “I am not intending to do some unlawful deed,” he said, “but to set up an altar, a holy and God-pleasing work!” The priests were cast into despair and terror-stricken by his threats, and with the other Orthodox present – who were not few – they ran towards divine assistance. Opening the holy reliquary of our great father, they chanted a Paraklesis, shedding abundant tears, hoping to hinder the governor’s bad intention. At around midnight on November 12th, the day on which the craftsmen expected to start their work, there was lightening and thunder – thunderbolts, one after the other. It was then that the guard of the governor’s residence saw a monk approaching him holding a lit torch in his hand. The guard, according to procedure, asked him once, and then twice: “Who are you? Where are you going?” And seeing as he did not receive an answer, he lifted his musket in order to kill the visitor. But then the monk answered: “I am Spyridon.” As soon as he said this he grabbed the guard by the arm and threw him with great force out into Spianada Square in the city of Corfu, close to the Church of the Crucifixion. There the guard found himself standing upright on both feet holding his gun as he had been before. Immediately following this, the saint lit the store house of the castle on fire. The extreme heat caused the buildings that were inside the governor’s palace and everything around it to collapse. The governor was killed inside, his neck having been crushed between two beams in such a way that it was as though they had been placed there for that purpose. The theologian was found outside the walls of the citadel in a ditch, into which all the squalor of the city sewer drained and flowed, holding his private parts in his hand. Many others were also killed, both men and women, some belonging to the court and others not, about nine-hundred souls. Around that time two other fearsome signs also took place. 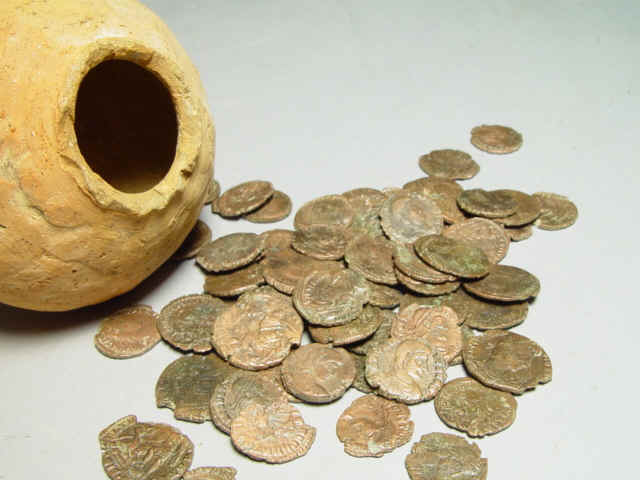 First: That same night, a large silver oil lamp that the governor had hung before the saint’s relics as an offering fell to the ground and its base broke into pieces, in spite of having been hung with a very strong chain. None of the numerous other oil lamps fell or suffered anything similar. And what happened to the oil lamp (or rather, the base) is apparent still today, because it was again hung up in the same manner it was found as evidence of the incident. Second: At the exact same moment (as was confirmed later by those who looked into the matter) a flaming arrow – a thunderbolt of lightening to be precise – struck the picture of the governor in Venice and burnt it up, without anything else in the house suffering any harm. His brothers and relatives immediately interpreted this as a bad omen concerning the governor. The rest of the Latin laymen and clergy, or rather the “Prevedore” as they were called, the Latin bishop, other officials and private citizens, as many as lived in the city of Corfu (for it was the home of the bishop’s palace and many others), these are who I call the rest, gave the command that the aforementioned building materials be taken from the Saint’s church. They made use of the materials elsewhere, save the marble slab which had been cut for the altar. This was reverently taken to their so-called “duomo,” that is the cathedral of their own metropolis, into the great altar. It can still be seen there today resting low on its side. The soldier, who had been the guard at the castle on that day, was roused and crying out in a loud voice, declared: “Saint Spyridon did these great and fearful things.” And he would tell the whole story in great detail. Therefore, the Latins, not wanting to bear the shame, sent him away to Italy three days later. This is the story of the frightful and monumental event that took place in the city of Corfu, owing to the most-divine Spyridon – quick to listen and patron of the city and of the whole Church. We must now consider carefully and in detail those circumstances, which prove the event undeniable, so that the enemies of the truth cannot blather, saying that the arson at the store house was a coincidence, from which the governor and those around him died. Source: Ouranou Crisis (Judgement from Heaven), Athens, 2007. In October of 1989, the pious and virtuous Mr. Evangelos Kosmas, a resident of Tinos, recounted the following very moving miracle performed by St. Spyridon on his behalf when he was a small child. I was then a little boy of five years. At that time, we lived in the village of Kathikaros, on Tinos. I remember one autumn morning when my father left to go to a funeral in the neighboring village of Tripotamos, which was about half an hour by foot from our village. He did not, however, take me with him. I dearly loved my father and wanted him to take me with him wherever he went, since he would carry me on his shoulders, and that made me happy. Since my father left without taking me with him, I decided — unbeknownst to my mother — to go to the village of Tripotamos to find him. Following the footpaths, I reached a point where there was a small stream. The water was then quite deep because it had rained recently, and, small as I was, I was not able to leap over it. So I sat there and cried, being unable to cross. As I was sitting there in that state, I noticed a small Chapel on the other side of the stream. The door opened, and an Elder came out and headed in my direction. He wore a heavy, woolen overcoat that resembled the capes worn by simple mountain shepherds. On his head was a round cap. After he had stressed this advice to me again, I set off for the village. Before I had gone more than a few steps, I wanted to take another look at the Elder, who should, I supposed, have been climbing up the hill to return to the place where I had met him. I turned my head but did not see him — he had disappeared…. That puzzled me, even though I was so young, since it was impossible for someone to ascend the long road that lay behind me in such a short space of time. While this perplexity gnawed at me, I headed for the village. I went to the Church, where the funeral service was still underway. After looking around a bit, I found my father sitting in a stall (stasidion) along the left wall of the Church. He was disconcerted at the sight of me and asked what I was doing there. I did not explain anything at that point, but simply announced that I had arrived. When the funeral was over, we took the road back home. When we reached the small stream and came in view of the Chapel, I told him exactly what had taken place. My father then took me into the Chapel, asking me: “If you see the Elder, will you recognize him?” I answered in the affirmative. My father then knelt in prayer. We lit the vigil lamp, censed the Church, and, after venerating the Icons, returned home. We recounted everything to my mother. My parents considered St. Spyridon to be my Patron Saint. Thenceforth, we attended the Divine Liturgy every year on his Feast Day, and every Saturday we cleaned the Chapel and lit the vigil lamps. To this day, I consider the Saint to be my protector.